As you all know , I love Rotary . I love Rotary because it is founded on the principle of service to humanity , because it promotes fellowship , cooperation and friendship throughout our community , and because it cultivates the highest standards of humanity and contributes to the establishment of peace in the world . 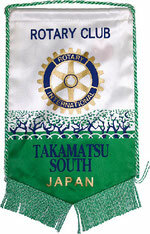 And I have a very special love for the Takamatsu South Rotary Club because of all the love and support its members have given me ever since I became a member back in 1987 . When I first came to Takamatsu in 1986 I couldn’t speak a word of Japanese . It was here in Takamatsu that I learned the one word that has become the key to all my success in Japan : “ Okagesamade ” . This might roughly be translated into English as “ My success is all thanks to you ” . This sentiment is one of the most beautiful fruits of Japanese culture and it expresses the essence of the Japanese spirit . Every time I say “ Okagesamade” “ I am reminded that I can do nothing of enduring value if I work alone , but that there is nothing we cannot achieve if we work together . 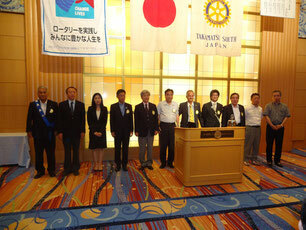 I have now been given the great honor and privilege of serving as the President of Takamatsu South Rotary Club for 2013-2014 . 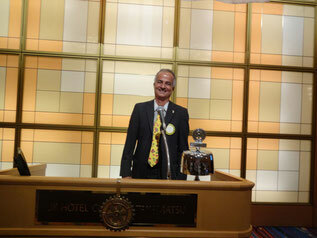 I am also humbled by the knowledge that I will be the first foreigner ever to serve as a Rotary Club President in Japan . This is not something I could ever have achieved on my own . Everything I have accomplished is all thanks to you , and to so many other friends in the wider community and throughout Japan who have helped me and supported me so patiently along the way . “ Okagesamade “ . This is a mantra that means the more we work together , expand our own circles of fellowship within the club , and take time to make acquaintances into friends , the more successful we will be . And taking this one step further , the greater the unity we can achieve with our sister clubs around Shikoku and the rest of the country , the greater the influence we will have , not only here in Takamatsu , but throughout Japan , and even throughout the world . Step by step we are playing our part in building a new world order , a new world civilization that will incorporate the best parts of every culture on the planet while slowly but surely overcoming the outdated practices and prejudices that keep us apart . Thirty years ago in 1983 our RI President Hiroji Mukasa from Nakatsu in Oita addressed 16,250 Rotarians and guests from 100 countries at the Toronto Convention . Speaking to the Convention on the theme “ Mankind is One”, President Mukasa said , “ We have seen how the human spirit proudly binds all peoples together through service ・・・ we have seen Rotarians at work building bridges in their own communities and in the world community at large .” Highlighting the unity of mankind , he said , “ I believe that the very future of the human family depends on our accepting the concept that truly we are all cousins , the concept that Mankind is One .” He observed that “ only human beings feel the need for friendship and peace ,” and he added , “ To get from the abstraction of what we believe to the reality of serving others means we must mobilize the talents and resources within our organization .” He stressed the need for emphasis on the extension of Rotary and especially membership development . It is when we work in fellowship that we feel the joy and satisfaction that comes with true accomplishment . During my term as President I hope to emphasize the virtue of gratitude , because it is gratitude that transforms weakness into strength , fear into confidence , and anxiety into hope for the future . 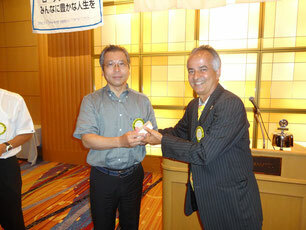 I hope that our Club can be a model among all the Rotary Clubs in Shikoku and in Japan for our unity in diversity , our sincere and heartfelt friendship , and our spirit of service . With regard to Club policy , I want to encourage all of our committees to meet on a regular basis and work hard to promote Club activities . I also want to encourage our individual members to feel free to offer suggestions and propose new programs . Let’s all make sure that our meetings are pleasant and enjoyable . And let’s work together to increase attendance at our home club regular meetings . We have many exciting things to look forward to during the coming year . In February 2014 we will host former Rotary International Director Bob Coultas and 10 other fellow Rotarians from New Jersey District 7470 in the United States . Many Governors , fellow Rotarians and diplomats from around Japan will also participate in this event , which will be a prime opportunity for us to develop closer ties with our sister Clubs around the country , and more especially throughout Shikoku . Speaking of developing closer ties with our sister clubs , we will want to send a strong contingent to the District Convention to be held in Kochi October 4~6 . There will also be a number of commemorative events this year . 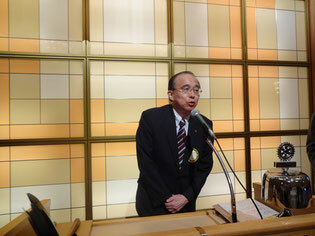 We plan to support an exhibition , to be held in Takamatsu , that will mark the 30th anniversary of the passing of Yoshitaro Kamakura , a Shikoku native who was designated as a living national treasure and whose foresight in making careful photographs and drawings of Shuri Castle before the Second World War were instrumental in the castle’s reconstruction . 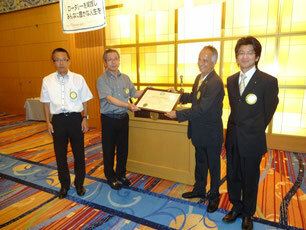 We will also send delegations to celebrate the 50th anniversary of the founding of Toyama South Rotary Club , and the 5th year since establishment of sister club relations with the Naha South Rotary Club . 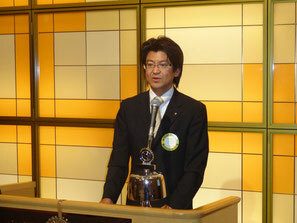 We will also continue our participation in the Ritsurin Garden project and our activities to honor Hachibei Nishijima for his unrecognized efforts to promote the Sanuki region . We will also support the Takamatsu International Piano Competition and Setouchi International Art Festival 2013 as well as the Setonaikai National Park which is celebrating its 80th aniversary this coming year on March 16th, 2014.